Show all your post types Present your existing posts, pages or any other custom post type, as well as WooCommerce products, with a featured image, title, excerpt text and link to the page on your newsletter. 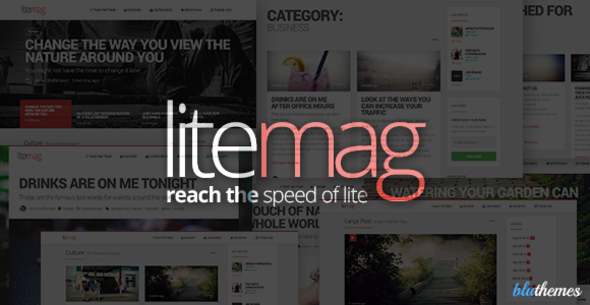 Choose from various designs Our plugin ships with some well designed responsive newsletter templates for your use. 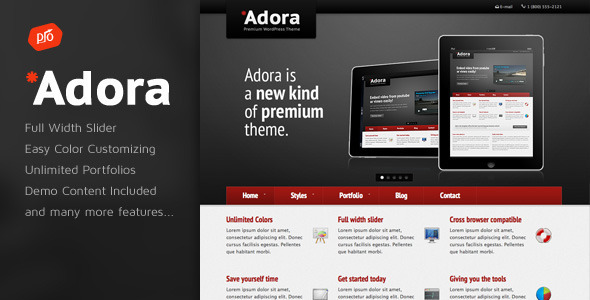 With the Pro-version you’ll regularly get new templates with the plugin updates. Create HTML newsletters in minutes You’ll definitely be surprised how easily and quickly you can create a fresh and modern newsletter, which will bring your email contacts back to your website, your Blog or your shop. Export clean HTML… … for further use with your favourite email marketing service provider, such as MailChimp, AWeber, Cleverreach, etc. Just import the generated HTML there. Adjust the design All colours for text and backgrounds can be adjusted to your needs. Similarly the length of the excerpt text and the wording of the “read more” button. The right image size WordPress creates several sizes for your uploaded images. 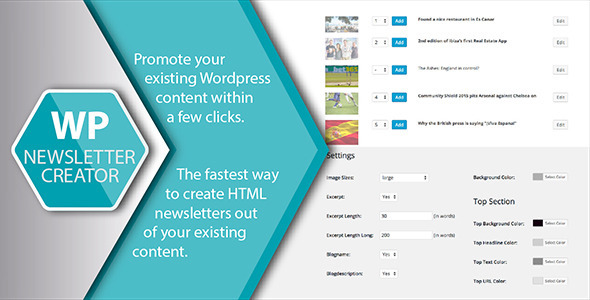 With WP NC you can choose which size fits best on your newsletter. Select articles you want to promote You will see all posts listed next to your newsletter layout. Just select the desired position number and click “Add”. Use of all post types Use some posts for your newsletter, a page as the main header story and maybe some of your WooCommerce products as well? Everything can be combined. Why you should use an email marketing service provider to send out your newsletter If you use email to send newsletters to a large number of contacts, you might encounter problems. Almost all hosting providers do not allow you to send out more than 500 e-mails at one time, some service providers have even lower limits. If you exceed the limit, your email will be flagged from the receiver’s servers as SPAM. It does not matter if, in fact, your email is not SPAM. Because of the high volume of email coming from your server, the problem will automatically present itself. Your server will be blacklisted, which means that your server will be evermore flagged as a SPAM sending server! For this reason, if you are sending high volumes of emails the best choice, in order to avoid unpleasant consequences, is to use an email marketing service provider such as MailChimp, AWeber, CleverReach and the like. This entry was posted in Newsletters and tagged newsletter creator, newsletter export, newsletter generator, newsletter html, newsletter template, woocommerce newsletter, wordpress newsletter on September 26, 2015 by Vera Jaman. 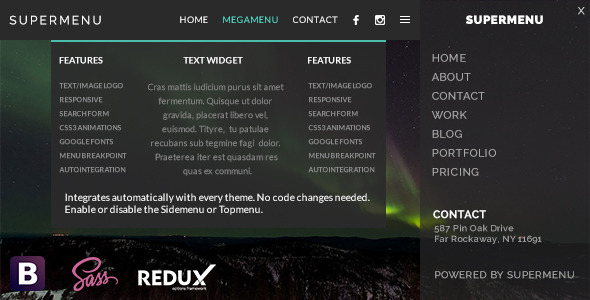 This entry was posted in Interface Elements, Menus and tagged animate, animated menu, bootstrap menu, dropdown, fixed menu, flat menu, mega dropdown menu, mega menu, megamenu, navbar, navigation, offcanvas, responsive menu, sidemenu, sticky on September 18, 2015 by Vera Jaman. This entry was posted in Interface Elements and tagged carousel, elements, features, font, grid, icon box, iconbox, icons, interface, list, plugins, services, shortcode, visual composer, wordpress on September 17, 2015 by Vera Jaman. 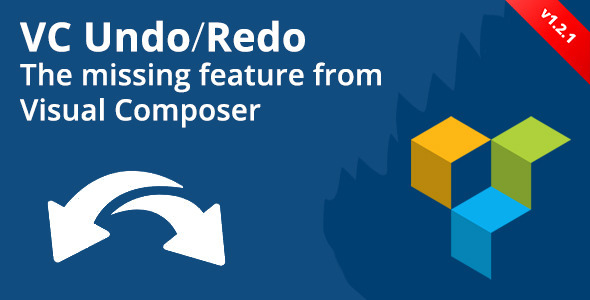 Visual Composer Undo/Redo is an add-on for WPBakery Visual Composer that bring a missing and useful feature: the standard Redo/Undo buttons. These buttons will now be shown in your visual composer editor and you can undo/redo your most recent changes the same way as you do with the classic wordpress text editor. Frontend Mode Now Supported: as many buyers requested it, even if it was so hard to figure out, but it’s not impossible, now you can undo redo changes even in the front-end edit mode! Automatic updates are managed by the ERROPiX Plugins Updater tool, which is included within the downloaded package. This entry was posted in Add-ons and tagged redo, undo, visual composer on September 16, 2015 by Vera Jaman. WordPress Admin Theme is a WordPress plugin to customize the entire look of your WordPress admin section and you can customize most of the admin elements as your wish. WAT comes with 43 in-built color themes which will help you to get started quickly on customization. WAT has Simple to use GUI to manage elements of the wordpress admin section. 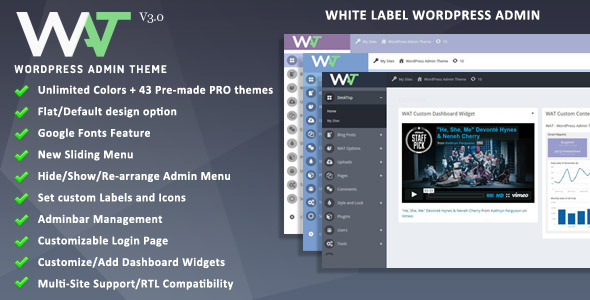 WordPress Admin Theme (WAT) offers Multi-site support. It means you can display your own color/elements settings to your network users/admins Or you can let each of your network users to customize their admin theme as their wish, Yes there is two choice to choose from. Interesting right? As a super admin you display your own theme and customize elements what to display to all your network users/admins. Or You can let each of your network admin to customize their individual blog admin theme. Custom logo options for login and dashboard pages. Customize wordpress dashboard widgets and display your own text and RSS widgets. Unlimited Color options + 43 in-built themes. Set any font for any element individually. Flat color and Shadow effect color options. Build your own theme for wordpress admin. Add or remove all or any admin menu items. Re-arrange all admin menu items. jQuery Sliding menu for admin menu. Show specific menu items to non-admin users. Show all menu items to specific or multiple admin users. You can select to which admin users to show all admin menu items. Ability to add custom links to admin bar. Customize Admin Bar logo background color. Dedicated Support System. You can open support tickets privately athttp://acmeedesign.com/support for your purchased products. Backup all the settings to your local system. This entry was posted in Interface Elements, Miscellaneous and tagged admin template, admin theme, custom admin, custom wordpress admin, dashboard theme, wordpress admin, wordpress admin template, wordpress admin theme, wordpress custom dashboard, wordpress dashboard, WordPress Login on September 16, 2015 by Vera Jaman. 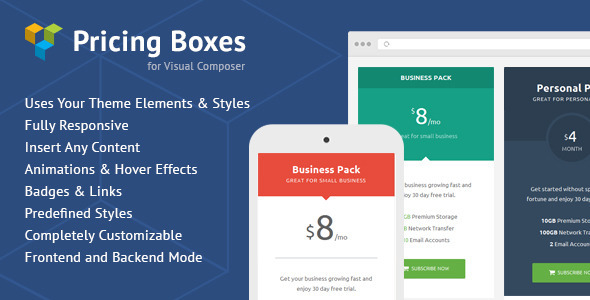 A BEAUTIFUL, FAST AND EASY WAY TO ADD PRICING BOXES TO YOUR WEBSITE USING VISUAL COMPOSER! 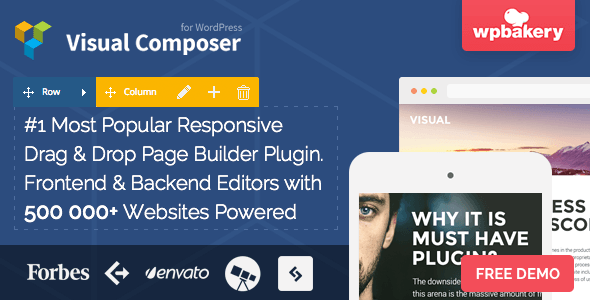 Compatible with Visual Composer version 4.3 and above. Preview built on Aperture WordPress theme. 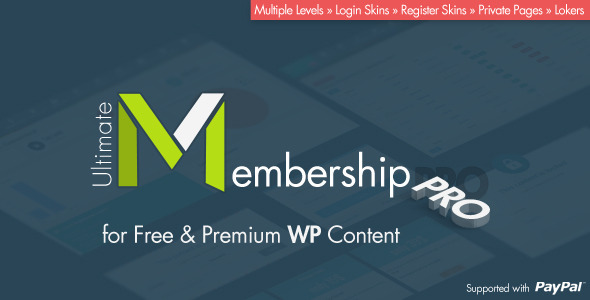 This entry was posted in Add-ons and tagged add-on, addon, clean, modern, pricing box, pricing table, responsive, visual composer on September 15, 2015 by Vera Jaman.